Bacharach Exhibiting at 2018 AHR Expo - Bacharach, Inc. The future of HVAC-R will be on display at the 2018 AHR Expo in Chicago, and Bacharach is pleased to announce that we will be showcasing our extensive range of gas detection products and solutions—including several new products. Stop-by booth #4623 to speak with one of our representatives and learn how our products are continuing to make HVAC-R safer, cleaner and more energy efficient. The AHR Expo (International Air-Conditioning, Heating, Refrigerating Exposition) is the world’s largest HVAC-R event, drawing in more than 2,000 exhibitors and 65,000+ attendees every year. Since 1930, the convention has provided a unique forum for the entire HVAC-R industry to come together and discover the latest products, learn about new technologies and develop mutually beneficial business relationships. This year’s show, co-sponsored by ASHRAE and AHRI, will be held Jan. 22-24, 2018 at McCormick Place, Chicago, and is held concurrently with ASHRAE’s Winter Conference. We are dedicated to making a measurable difference with every product we make. Visit us to learn more about our extensive range of gas detection products and solutions for the HVAC-R industry. The 2018 AHR Expo will mark the first time that Bacharach will be exhibiting Parasense refrigerant leak detection / energy management solutions since their acquisition in 2017. Parasense’s cloud-based energy management platform allows users to track and report on refrigerant usage and energy consumption across multiple sites. MVR-300™ – Discreet refrigerant detector for occupied spaces. HGM-MZ – High precision refrigerant monitor capable of monitoring up to 16 remote areas. MGS-550 – Industrial refrigerant detector. MGS-150 – Commercial refrigerant detector. MGS-250 – Infrared refrigerant detector. 3300RM2 – MIL-SPEC (MIL-S-901D, MIL-STD-167-1-A and MIL-STD-461F) compliant refrigerant monitor. Bacharach has been pioneering the development of combustion analysis instruments since 1909. 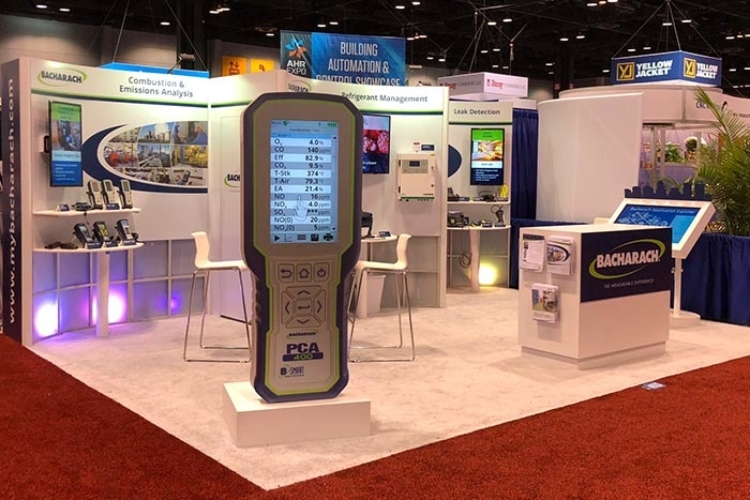 We’re proud to continue that tradition of excellence with the PCA® 400, a combustion analyzer designed for commercial and industrial applications. PCA® 400 – Commercial / light industrial combustion analyzer with optional sample conditioner. Fyrite® INSIGHT® Plus – Commercial / residential combustion analyzer with Tune-Rite® virtual assistant. Fyrite® Intech® – Entry-level residential combustion analyzer. Monoxor® Plus – Advanced carbon monoxide analyzer. PGM-IR – Portable refrigerant monitor capable of detecting gases as low as 1 ppm. H25-IR PRO – Industrial leak analyzer with ALQ™ technology. Leakator ® Jr – Hazardous location-certified combustible leak detector. Tru Pointe ® 2100 – Ultrasonic leak detector with noise-cancelling headphones and optional SoundBlaster®. We would like to everyone who helped us make this year’s expo such a wonderful success. Thank you for making a measurable difference!